It's not entirely an exaggeration to say that I first went to England for CD singles. And that constant mission of being on-the-lookout for a new find involved my favorite record stores as well, all now gone. So the death of the single means, as the NME rightly surmised, the death of the flipside, and the death of music retail as well. I had no problem digitizing my collection and selling or storing it. C'mon, admit it: It *is* more convenient to have dozens of Manic Street Preachers singles in one long list in my iTunes software than having to open and play them individually, isn't it? And having one massive Luke Haines playlist is a trifle easier than sifting through his various projects under a half-dozen or more different names, eh? However, that's not to say that I don't miss the shopping. As I recalled on Facebook, there was something magical about finally finding Kenickie's "Millionaire Sweeper" on CD single in 1999. It was my first trip to England and my last day in London when my friend Mike and I stumbled upon a record fair in Camden. With barely an hour to go on that Saturday afternoon, we FLEW through the merchants' stalls, sometimes flipping through collections being boxed up by sellers at the time. I remember not finding a lot of treasures -- some things were a bit overpriced in all honesty and we had just spent 3 days buying hundreds of things from the bargain basements of the Music and Video Exchange shops in London -- but I did finally get that Kenickie single which I desperately needed to complete my collection at the time ("Catsuit City" was still quite out of reach -- was it ever on CD? -- and *I think* I found "Skillex" on CD a few days earlier) and that memory is certainly richer than just pointing-and-clicking will ever be. Less than 4 minutes of music, but I'd rather have 4 minutes of interesting flips than a 50-minute Stereophonics album anyday but that's just me! 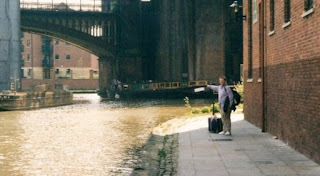 In conclusion, I offer this photo of myself in the English April of 1999, near a famous watery landmark in Manchester. This is about 4 days after that record fair and, if you look very closely, you will see a bulge in that suitcase, said bulge being the mass of CD's and CD singles accumulated in the previous week in London and Liverpool. Yes, I'm the guy who took a chance on Northern Uproar for 50p-a-single! No gems in that flipside catalogue but it was certainly fun weeding through it.